If you are looking for a Camping & Caravan site in North Cornwall's quiet and scenic countryside, then Lower Pennycrocker is for you. Situated on a Farm that is set in an area of outstanding natural beauty with the most breathtaking views, our site offers all you need. The beautiful harbour village of Boscastle is just a stones throw away and the legendary Tintagel and King Arthur's Castle is just five miles away. Bude its famous surfing beaches is only seven miles away. 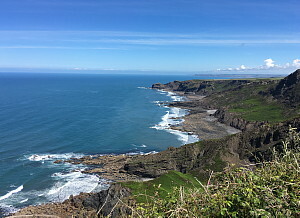 If walking is your passion then the highest cliffs in Cornwall will provide you with some spectacular views. Maintained by the National Trust the walks are easily reached and are endless. With fantastic coastal scenery to see, you will want to return time after time. We pride ourselves in the return of visitors who have stayed with us year after year. 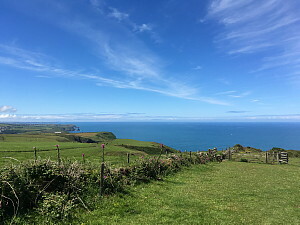 We feel that once you visit North Cornwall's cliffs, beaches, local fishing villages and experience the magic that makes North Cornwall the special place that it is you will certainly want to return. ADULTS £8.00 per night. CHILDREN £4.00 per night. No charges for awnings or pup tents. There are free showers and wash up areas which have been refurbished January 2014.
with any questions about the campsite. If you are looking for a Camping & Caravan site in North Cornwall's quiet and scenic countryside, then Lower Pennycrocker is for you. Situated on a Farm that is set in an area of outstanding natural beauty with the most breathtaking views, Lower Pennycrocker offers all you need. Copyright © C&K Heard / Kestrel 2004-2016. All rights reserved.